When I went through recruitment, I had no idea what the sorority women were going to ask me. I had no idea that I could ask them things. I feel like every conversation surfaced around the same questions: Where are you from? What’s your major? What dorm do you live in? Who do you live with? These were superficial questions that didn’t really matter. We live in a world where so many of our first interactions with people happen over technology. The fact that we are growing up in an age where technology is our vehicle means that we aren’t always trained to be comfortable with in-person conversations. As this becomes more and more evident, I think it has become even more critical that we help our Potential New Member (PNMs) prepare for conversations in recruitment. 1. Have PNMs ask more questions. We have the opportunity to start encouraging PNMs to ask questions to chapter members. Our process isn’t an interview. However, our chapter members are trained to ask questions and get to know the PNM. We need to provide training for the PNMs about how to ask relevant questions about each chapter so they can better understand the women and the organization. Remember, recruitment is about creating relationships. Relationships are a two way street. 2. Make Better Use of Recruitment Booklets. So many Panhellenic communities print booklets for PNMs with information about the community and each chapter. We should consider utilizing these as a method of training for the PNMs – particularly in conversations. Our booklets give us a vessel to provide reflection questions for the PNMs to answer that are relevant to our values-based recruitment systems. It’s important for us to give PNMs the tools necessary to prepare for their values-based conversations, and our reflection questions can be a great way to help them. Reflective questions will give them opportunity to think about relevant discussion topics for their conversations. 3. Intentionally explain what Values-Based Recruitment really means. Once PNMs have arrived for recruitment (and hopefully have done their reflection questions), we can provide some tips about values based conversations, what to expect in them, and how these values conversations will benefit our overall recruitment process. The word values can be intimidating for PNMs, so it’s important for us to take the time to explain what it means for them and provide them the tools to be successful in those conversations. Our training can also include some tips about how to stay away from superficial conversations. We train our chapters to have deep meaningful conversations and we want our PNMs to understand that those conversations are encouraged. Our conversations are vital components throughout our process and to values based recruitment. In order for our PNMs to connect with our chapter members, their conversations are critical. That makes it critical for us as sorority women to take the time to help our PNMs understand the importance and value of their conversations, and give them a little guidance on how to do it. Feelings of depression, anxiety, and issues with self-esteem… are they a reflection of sorority recruitment, or words to describe the life of an 18 year-old girl? For me, and millions of other young women, it was a reflection of both. The recruitment process causes heightened levels of anxiety for many women who participate. It does in the same way that applying for college increases levels of anxiety, the same way that fear of rejection can cause us to feel depressed, and the same way being in middle school can lend itself to issues of self-esteem. Leaving your family for the first time causes these emotions. Trying out for a sports team causes these feelings. Dating causes these emotions. For many, daily life can cause anxiety, depression and lower self-esteem. Going through my own recruitment process I had a phenomenal support system waiting back at home for me. My mother is a professionally trained counselor who spent an entire week sitting by the phone at night waiting for her baby to call with any news. My recruitment was ‘successful.’ I received my number one pick from preference, but that does not mean it was all rainbows and butterflies along the way. For the most part I had a perfect resume for a Potential New Member (PNM) minus the fact that I was not a legacy to any chapter, which was not a deal breaker at Washington State (or any of the Pac-12 Schools for that matter). I was in the top 5% of my high school graduating class. I had hours of community service, served as captain of the cheerleading team, president of DECA, and volunteer coordinator for National Honor Society. Minus a pretty dramatic hair dye job my childhood friend and I shared together the summer before college, I am confident my pre-rank score was on point. But I still remember the first woman who was rude to me. I remember her hair, her name, and her shoes. Like a picture. I remember the first stonewall being built around my heart in sorority recruitment. I remember sitting outside of Delta Delta Delta on Philanthropy day and hearing stories of family wealth that I had no idea existed. I remember being ‘cut’ or released from my top pick going into preference. I wanted to be in that chapter because my incredibly intelligent and developed high school boyfriend told me it was the ‘hot chapter’ (He was a year older me, and already went to WSU and joined a fraternity). I remember desperately wanting to be pretty, beautiful and perceived as hot in college. I was always a late bloomer/ugly duckling (I drove myself to get braces – and wore them to my senior prom). So, I just wanted to arrive. There was a lot of anxiety wrapped up in sorority recruitment for me. I wanted to be good enough. I wanted to be understood. I wanted to win, because I have always been competitive. Mostly, I wanted to find where I belonged. As a junior and senior in high school, I knew my chances. I went to a small school and the probability of someone like me succeeding at a large state-funded institution was dismal. I heard horror stories of women in my older sister’s high school class having panic attacks at the University of Washington because they were now a small fish and they just could not hack it. My own older sister selected a small private school because of the warnings we heard about those scary large schools. I saw this as a challenge. I read in every college prep book to get involved. During each of my college tours the tour guide would say going Greek was a great way to make a large campus feel smaller. I had found my in. I did not join to increase my self-esteem… I joined to belong. Being rejected from my top pick rattled off a downward spiral in my brain of negative self talk, starting with, “Maybe you did not wear the right thing.” This quickly transpired to, “You are not very funny, you are not that cool, you really are not that pretty, your parents do not make enough money, you are not a top person… why would you be in a top chapter?” That lasted for about 98 seconds, because I was being scooted in my dress and heels to preference day ceremonies (finally sans braces). If you had asked me in that moment if I was depressed, I would have said “yes”. I also experienced anxiety because I did not think my Recruitment Counselor liked me as much as the others. I hated that. It gave me more anxiety because I knew there were girls in my group who were texting their friends from other chapters – and that was against the rules. I was also experiencing anxiety because I knew through the grapevine that my boyfriend had cheated on me with MULTIPLE people at WSU who were in sororities, and it was AWFUL trying to navigate the conversations and figure out which chapter was which so I would not join a chapter and be immediately ostracized! These are not just sorority recruitment problems. They are problems that sadly, some portion of 18 year-old freshmen experience every year. They are the problems of an 18 year-old female who is a competitive achiever. Like I said before I got my number one pick from preference… but not overall. Which, in all honesty, has been the BEST THING TO EVER HAPPEN TO ME. Bid day started out amazing and ended terribly… with me crying alone. Three weeks after bid day I broke up with my boyfriend (he was in a really “good” fraternity on campus… but lets be clear there are plenty of fish in the sea). Homecoming happened, and it was amazing. We had “the Freshmen talk” as a pledge class where the executive board come into our meeting and yell at us about how we are “THE WORST pledge class ever” and how we party WAY too much. Mostly they told us that they worked too hard on our chapter’s reputation for us to destroy it and we had to shape up. None of that could have prepared me for what was coming next. My first semester, I felt constantly alone. I felt exhausted, dancing 10 – 15 hours a week, taking 15 credit hours. I remember walking home to my residence hall after dance feeling dizzy, exhausted, burnt out, and just not having the energy or stamina to go to a lonely dining hall and eat all by myself. I did not become anti-social, but I became tired. I lost about 15 pounds and 3 pant sizes. It was pretty traditional depression. Not being able to run down from your bedroom and eat with your parents kind of stuff. Not seeing your Mom right before you go to bed, or having your Dad come into your room every morning and kiss you goodbye before he went to work. It was the loneliness that tormented every other person at my school at some point. The day that saved me was the day our Chapter President Ashley announced in her first ever chapter meeting that there were 6 spots opening up in the chapter house for anyone who wanted to move in. In order to move in you had to have points, and if there was a specific reason then you had to submit those reasons ASAP. I went up to Ashley after meeting and begged, pleaded and cried to her… Little did I know I had the highest points allowance of anyone in my pledge class. I moved in on January 6th. I immediately gained the weight back and a few extra pounds. When I was lonely I walked downstairs. My grades decreased a little but bounced right back up after that semester. For the most part, Kappa Delta saved me. I continued to suffer from self-esteem issues with my body image, dating, imposter syndrome, and the overall fear that I was not good enough. That was not Kappa Delta, or Washington State University’s Panhellenic system… that was me, that was my environment, and mostly that was being a girl growing up in America. This is how it feels to be a girl. This is not a result of sorority. 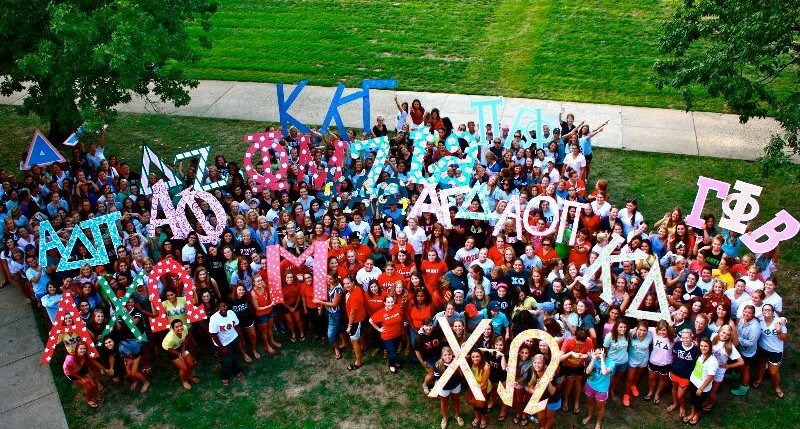 We criticize sorority for hurting the self-esteem of our young women. We say recruitment causes anxiety, depression and lack of connection for joiners and our would be joiners but we don’t criticize Universities for creating the same emotions because they are prestigious organizations that are only accepting of the best. Maybe we are that as sorority, too. It is not our job to accept everyone. Some people are going to feel rejected. I felt rejected when I was declined by the University of Washington for graduate school. It took me two months to bounce back. Do we see any similarities? We cannot protect you from the rain, we cannot protect you from the dark, we cannot prevent the sadness and loneliness that comes with college, and from living a full-hearted life!, However, sorority, will be here when the rain clouds darken your life. We will be here when the wind howls at your door. We will be here when the rain soaks your soul. And we will be here when you are not healthy, happy and confident. We will hold you in the dark and tell you to hold on. I did not join sorority to never feel pain, anxiety, depression, sadness, or fear. I joined a sorority so when those emotions did set in I had a support system to get me through it… and Kappa Delta did. It did all of that and more.